I've owned many electrostatic loudspeakers in my life, and I still marvel at just how transparent (pun intended), clear, and revealing they can be. Getting them to produce room pressurizing bass and big dynamic swings as well has been the difficulty with many hybrid designs. Roger Sanders seems to have conquered these problems better than most. 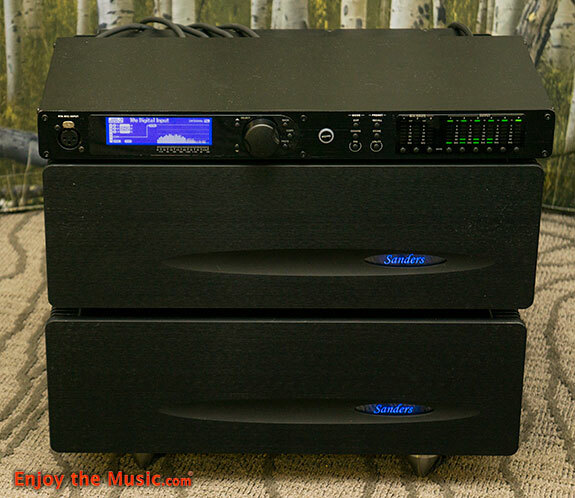 The Sanders 10e speaker system ($17,000/pr) includes a Sanders Magtech Stereo amplifier ($5,500) and a Sanders Loudspeaker Management System. 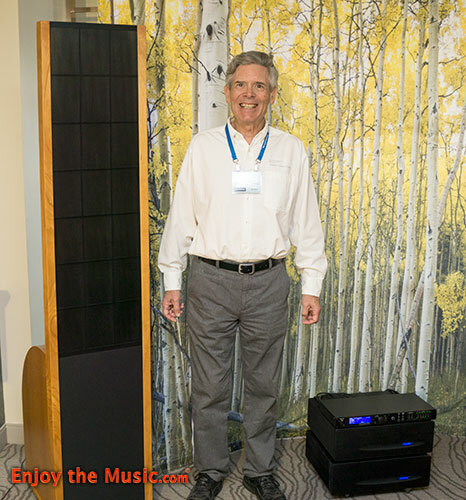 The 10e speakers are bi-amp only, and Roger incorporated a second Magtech stereo amplifier for the demo here, total for the system is $22,500. The LMS is an electronic crossover and room correction device. 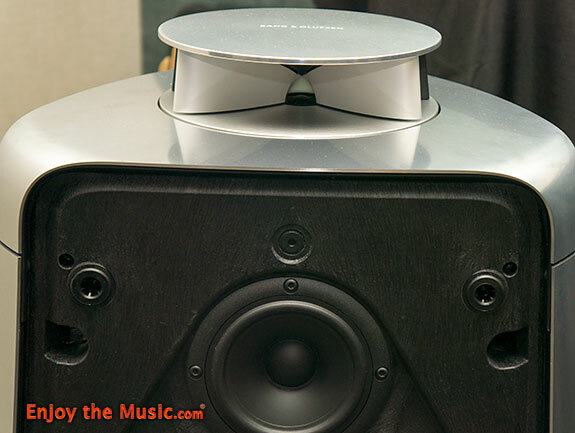 Roger told me the secret sauce to his design is the use of 48dB/octave slopes between the 10" aluminum coned woofer and the electrostatic panel, centered around 170Hz. This keeps the woofer from blurring the clarity of the panel, and allows the panel to keep up with the woofer without straining or exciting it's resonant frequency. 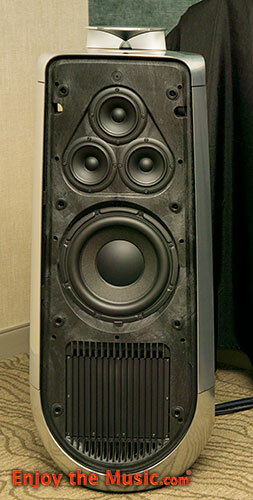 Here we have electrostatic detail and clarity along with huge dynamics and room crushing bass response. Transients were quick and accurate, cymbals and rim shots were sensational. Stevie Ray Vaughn rocking out to "Tin Pan Alley" was breathtaking, drum kit had great impact, guitar cut through everything, vocals revealing and real sounding. One of my Denver friends brought his son to the show Sunday and this was one of three rooms that stunned them, so clear and real sounding they reported, I have to agree, great room Roger. The B&O room was sparse, really only the speakers were showcased. 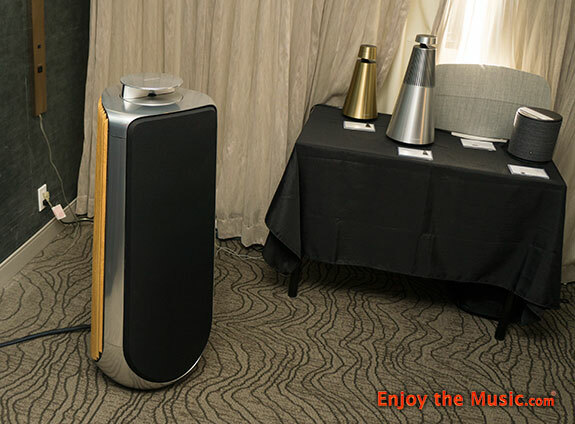 The Beolab 50 speakers ($39,400/pr) looked more like a sculpture than speakers, were spread wide apart at the front of the room. 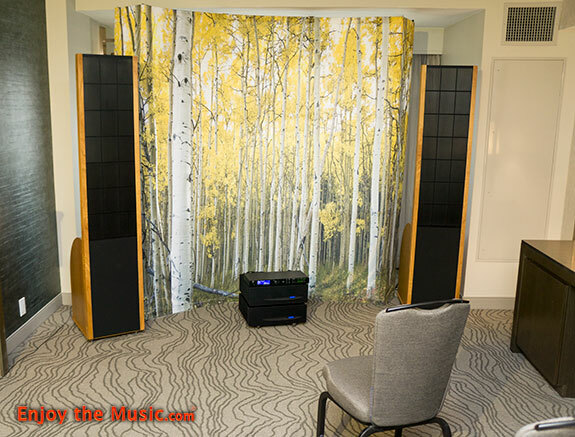 The demonstration included listening to two different settings, wide and narrow options. The settings remotely moved a motorized lens in front of the tweeter optimizing the sweet spot for a single listener in narrow mode, and in wide broadened the listening focus for a group of people. The demo was very accurate, in narrow the vocals were focused tight and the correct height, and in wide the focus loosened and all seats sounded pretty good. The Weeknd's voice was nicely sized, bass impact had good slam, but the overall presentation was off-putting. I heard Stevie Ray Vaughn's "Tin Pan Alley" and it seemed larger than life, it struck me like a B&W movie that had been colorized. I liked it more as I listened, but the Beolab 50s need to be auditioned to be sure you like the effect, unless you just want gorgeous speakers that don't look like speakers then go ahead and splurge. ---> Back to main RMAF 2017 show report page.